Re: I - The thumb represents the inner essence of man! What is your thought regarding this suggestion/option? Have you ever considered things like this? Yes of course. It's all part of 5 element hand analysis. Whislt ALL the 4 digital mounts are in the earth zone of the fingers, and the horizontal air zone of the palm, the individual digital mounts have the same rulership as the finger they are under. Moon mount is ruled by water, and the other water mounts (pluto and neptune) are also in the water quadrant. Mars of course is ruled by fire, but the alternative for ulnar Mars is Uranus, which is ruled by air. short pinky = fear for 'two-way street' interaction (in terms of: communication, relationships & intimacy! No Patti, to me it appears that you misunderstand my point. I could also put it like this: my point is that ANY underdevelopment in any zone of the hand can be associated with fear, because one could say that the underdevelopment indicates that the energy involved with that hand zone is too weak... but that does not implicate that 'fear' is connected to the pinky finger itself... because 'fear' is only the direct result of the underdevelopment! Again, in this topic we have hardly talked about under- and overdevelopment... so I can not recognize your LATEST series of key-words to represent any significance for the pinky finger it self at all. (And again, communication, social interaction, relationships & intimacy do represent major themes that usually get associated with the pinky finger... and all these activities require another ACTIVE person to get involved, and this need to get another person involved can be recognized to symbolizes a form of submerging consciousness with the outer world... with the consciousness of the other individuals that get involved). Whislt ALL the 4 digital mounts have earth rulership when considering the fingers, and air rulership when considering the palm, the individual digital mounts have the same rulership as the finger they are under. Then I think it would be a good idea to promote this aspect of the elemental system much more. Because I feel like this is probably a good opportunity to show why hand reading basically does not require anything related to astrology. PS. Lynn, I have the impression that so far you have never described this more detailed idea regarding the palmar zones in any discussion in the past. Is that correct? Martijn (admin) wrote: PS. Lynn, I have the impression that so far you have never described this more detailed idea regarding the palmar zones in any discussion in the past. Is that correct? I can't remember if / where I've discussed this before, maybe not. Palmar mounts are in Dukes 'Chinese Hand Analysis' see charts on P57-58. Thanks Lynn, yes... Dukes has described those principles; but he described these combined with the so-called 'mystery planets' (including: vulcan, pluto, neptune & uranus). So, his model is a bit different compared to what I have mind. (By the way, since vulcan is only a fictionary planet, and pluto is no longer recognized as planet, Dukes' model has become a bit outdated, thus one could recognize his model to be unnecessarily complicated... with non-existing planets involved, etc). I am only in doubt regarding how to describe the thumb more precisely; in classic palmistry the (external) thumb did not become associated with a planet... so maybe it would make sense to just associate the external thumb with 'ether'; and not to associate the individual external thumb phalanges with any of the individual elements... because ether represents a dimension that can not be described in terms of just the elements water and fire... because the side-effect of using those elements for the individual thumb phalanges is that this suggests that the element air is sort of missing in how ether manifest via the thumb (so maybe one could describe it as an oversimplification to associate the nail thumb phalange with fire and the 2nd phalange with water???). It's really absurd to make make a Mars mount "Air". This is also the first time I had heard Uranus to be assigned to that area! I looked at the book last night and saw that it was the higher level or octave for Mars. In other words for people who have reached some spiritual state of ascension while still alive. A rare state to reach for most people. Uranus has also been assigned to the Ring finger and to the Plain of Mars by various authors. I'd prefer Uranus for the ring finger over any other location of the hand. p.s. : Pluto has only been reassigned astronomically, not astrologically. It didn't suddenly lose it's effect because an astronomer said so. p.p.s: I would also prefer the Sun for the thumb. This is a very good example of why the elements should not be used for matching areas of the hands to an individual element. It becomes reduced to assigning leftover hand features or left over elements. Then the process is based on matching elements to the hand and not the hand to the elements, or colors, or numbers, or symbols to suit a person's religion, philosophy, agenda and viewpoint. Patti wrote: It's really absurd to make make a Mars mount "Air". This is also the first time I had heard Uranus to be assigned to that area! I looked at the book last night and saw that it was the higher level or octave for Mars. In other words for people who have reached some spiritual state of ascension while still alive. A rare state to reach for most people. Patti, what is your problem really??? I think your response indicates that you (continue to) struggle to perceive things in perspective. Because in the field of hand reading mars is usually described in terms of a body/emotion-related component (mars-negative or active mars, which often gets associated with themes related to: physical power, aggression, and action) and a mind/spirit-related component (mars-positive or passive mars, associated with themes related to: mental power, defense and justice). And thus I think it is obvious that the mental-component of mars can be associated with air (in Johnny Fincham's first book you can see on page 6 why this connection does make sense - because mars-positive is located partly in the air quadrant, and in Johnny Fincham's 2nd book you can see in his picture example on page 81 that mars-positive is fully located in the air quadrant). By the way, I observe that you haven't even tried to rationalize your perception regarding the 'outer mars' connection with 'air'... you only called things absurd, in order then to make a few comments regarding your perceptions of uranus & pluto. Sorry Patti, I have no idea what you exactly mean. The model that I described does not leave any hand features nor any elements "left over", and it is quite similar to the principles described by Dukes & Fincham. Patti, does this implicate that you would also prefer to use the sun for the thenar? (If not, then I would describe your preference as a rather 'wacky' option... because that would implicate that in your result the thumb becomes connected with two planets: venus + sun - which would remind of Gettings' later work, where he described the external thumb as 'mars' + and the thenar as 'venus'... but Gettings also associates the sun with air, which appears imcompatible with the fact that sun can in terms of physical properties best be described as as a pure 'fire' planet: for the large part consisting of hydrogen in it's plasma state - which directly relates to fire. My reasoning was made long before I owned a Getting's book - it's written about in my notes from the classes I gave in the mid 80's. Apollo, Jupiter, Saturn and Mercury are mythological gods. They were assigned to the planets as they circled the earth. The earth was seen as being in the center and everything spun around it. Mars, Venus and the Moon also circled this geocentric earth. Uranus was yet to be discovered when the known celestial bodies 'orbiting the earth' were assigned to parts of the hands. In 'modern' times, it seems odd to have the sun as just an ordinary digit. Uranus represents change and it works with Saturn to break down established foundations either by choice or by force. I also think there are many aspects to the description for the ring finger that match Uranus energy. However, I'd keep the sun line as the sun line. 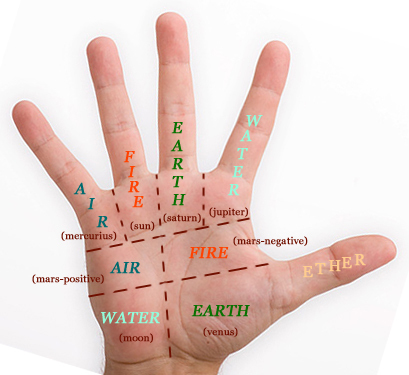 Lynn mentioned Uranus/Air as a substitute for Mars/Fire in the Ulnar Mars section of the palm. Not Mars/Air. I also think the "German School" including Manfred, place Pluto in this location and Pluto is associated with Water. Well Patti... funny that you mentioned Manfred's name & the 'German school', because look what I have just found!!! And... when we now look back at Manfred's earlier input in this discussion, then we can see how big the confussion at that stage really had become (as it appeared that Manfred had confirmed Lynn's point of view, see: http://www.modernhandreadingforum.com/t2419p780-the-thumb-represents-the-inner-essence-of-man#26795 ). I think the maps above clearly CONFIRM that the 'you-side' for sure does represent the 'outer realm', 'surrounding world' (= Hürlimann's words)... or 'outer world' (my words) - and thus Hürlimann's works does not vary from von Mangoldt's work (but Manfred sort of described von Mangoldt's work as old-fashioned, and assumed that Hürlimann's work is more accurate... while I recognize now that both German authors are using the same principles... which are both actually very different from the classic principle 'radial = outer, ulnar inner'). Patti, you have denied this in your interpretation of von Mangoldt's words; but now it has become more apparent via Hürlimann's work that my interpretation (regarding: you = outer) was actually correct! And we can also see how the radial side represents the 'I-side', the side of the 'self', and the energies which make it possible to 'assert' this inner self! In my view, this illustrates the importance of my idea that it is always important to use 'consistent' concepts, because otherwise things easily get turned upside down! And in my view, this also illustrates how subjective your perceptions really were at the moments that you thought that I had misread things completely... or that I wanted to present some kind of new model for the hand. Because from the start of this discussion I have tried to point out to the underlying principles of the major key-words that have been used in the field of hand reading. So... the parallels between Hürlimann's use of the words for the ulnar side of the hand ('outer realm' & 'surrounding world') and the principles used by Dukes & Fincham ('public' & 'public stage/world stage/outer world') are obvous. And Sprong & Birla's use of the principle 'thumb = inner world' actually represents the other side of the same coin! So far, it appears that the principle 'radial = inner/I-side, ulnar = outer/you-side' could have it's origins in the 20th century German school. "Most of the world today practices systems that developed in Europe in the nineteenth century." However, it appears that Campbell had no access at all to the later developments inside the German school of the 20th century (possibly due to a combination of the fact that those German books are usually written in German language + the impopularity of the German regime in the first half of the 20 century!!). 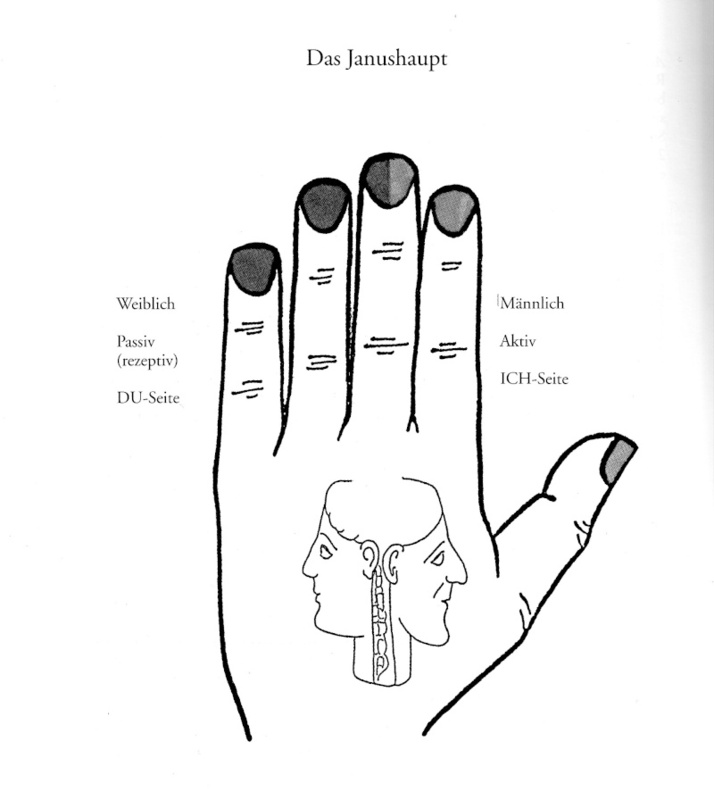 The name Issberner-Haldane is mentioned exactly once in Campbell's work as a significant representative for MEDICAL palmistry - but only via a reference inside Andrew Fitzherbert's work 'The Palmist's Compagnion'; the works of the other 3 German authors mentioned below are not mentioned in Campbell's work at all! (By the way, one could associate the work of Charlotte Wolff in the first half of the 20th with Germany... however, Wolff actually has Polish origins). PS. Out of the 11 authors listed below, only Dukes, Hutchinson, Issberner-Haldane & Sprong are mentioned in Campbell's book (that's 4 out 11 authors); which I still perceive as valueable... but regarding the topic of the thumb I could say now that it presents an INCOMPLETE picture of how the thumb has been described in the field of hand reading! In this 2011 Dutch study researchers have studied the 2D:4D digit ratio and 3D:5D ratio, which both represent measures for radial finger length development vs. ulnar finger length development. The researchers studied whether both digit ratio have a connection with a tendency to externaliz problems (via aggression related symptoms) or internalize problems (via anxiety or depression related symptoms). "Thus, we expected a lower 3D:5D ratio (and 2D:4D ratio) to be associated with more externalizing problems, and a higher 3D:5D ratio (and 2D:4D ratio) to be associated with more internalizing problems." 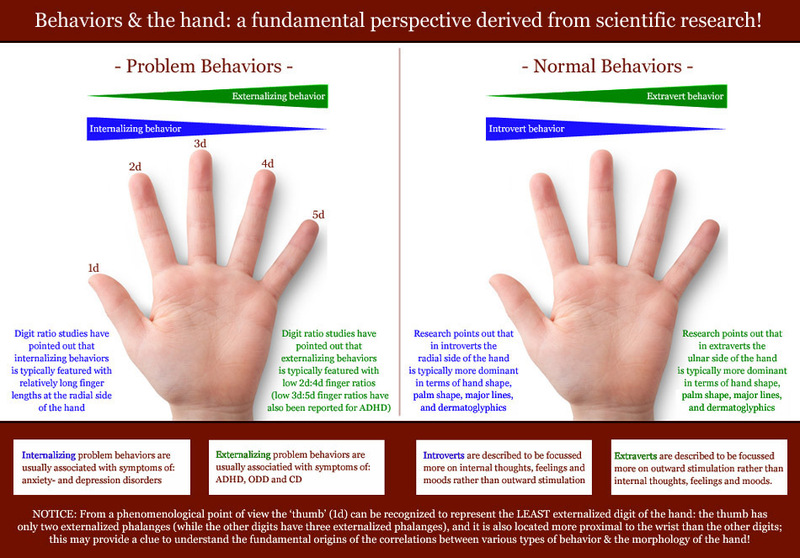 This implicates that the preceeding research has pointed out that stronger development in the 4D and 5D digits is likely to result in higher 'externalizing symptoms', which stronger development in the 2D and 3D digit ratio is more like to result in higher 'internalizing symptoms'! 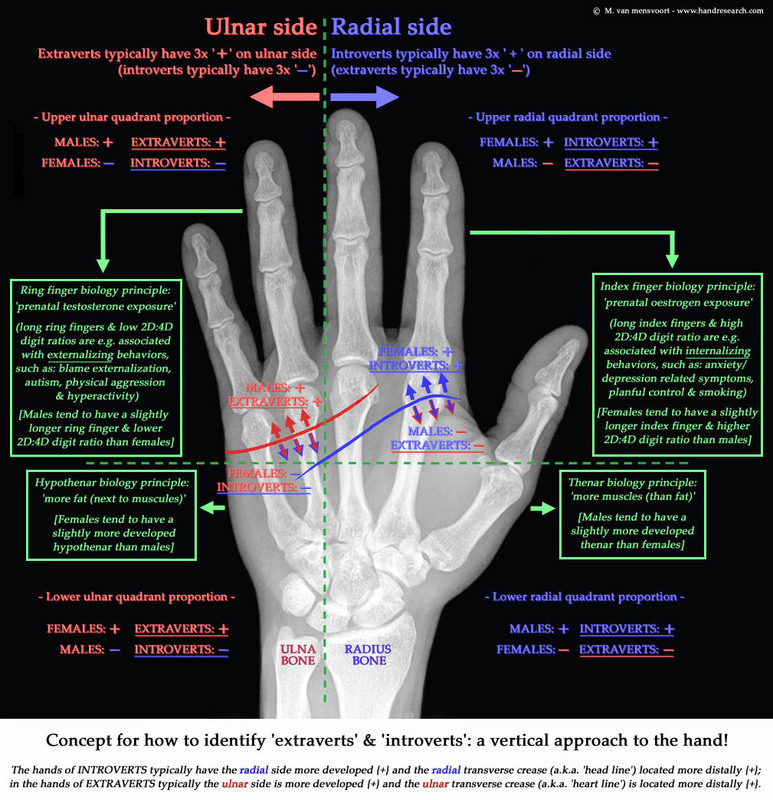 Which shows a clear parallel regarding the modern principle: 'radial = inner and ulnar = outer'!!! PS. Less important... the researchers also concluded that the results (see table 2) have partly confirmed their hypothesis. "In the Austrian sample, lower 2D:4D ratios was related to more externalizing problems in girls and more social problems in boys (Fink, Manning, Williams, & Podmore-Nappin, 2007)." "Thus, two studies utilizing diagnosed child samples (de Bruin et al., 2006; McFadden et al., 2005) found that children with externalizing disorders had more masculinized finger-length ratio patterns, findings that are consistent with the idea that higher levels of prenatal testosterone exposure are related to increased incidence of externalizing disorders and increased inattentive symptoms in childhood." "To summarize our findings, sexually dimorphic digit ratios were significantly related to ADHD symptoms in boys but not in girls. Prenatal testosterone exposure may serve as a general risk factor for the development of externalizing disorders in childhood with specific effects on inattention." So, the 5 reports together mentioned in the study above illustrate very explicit that the Manning's hormone hypothesis directly supports the concept that the ulnar side of the hand more relates to how problems become manifest as 'externalizing disorders/social problems' (which typically tend to become manifest in how a person functions in the outer world - behavior related disorders such as autism also belongs in this category). And the radial side of the hand hand more relates to how problems become manifest as 'internalizing disorders/neurotic problems' (which typically tend to become manifest in the inner world - psychotic disorders such as schizophrenia also belongs to this category). PS. Though the thumb is not included in most of these studies, the results of these study show a clear tendency that confirms that the ulnar side of the hand should best be recognized as the externalizing/social side of the hand (and the radial side as the internalizing side of the hand). 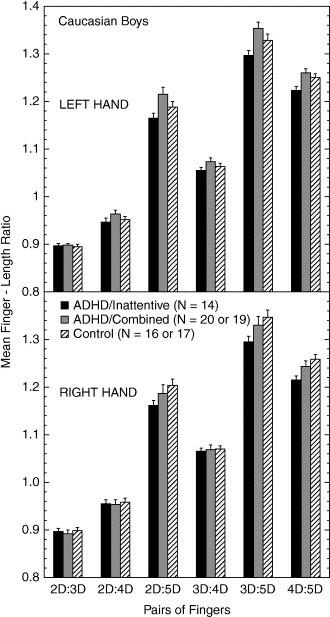 thumb & radial fingers correlate with introvert and/or internalizing behavior! The long opposable thumb is recognized to represent a symbol for the evolution of the superior human brain. Can the thumb also serve as a marker for individual behavior? The answer appears to be 'yes', because most finger length studies (e.g. 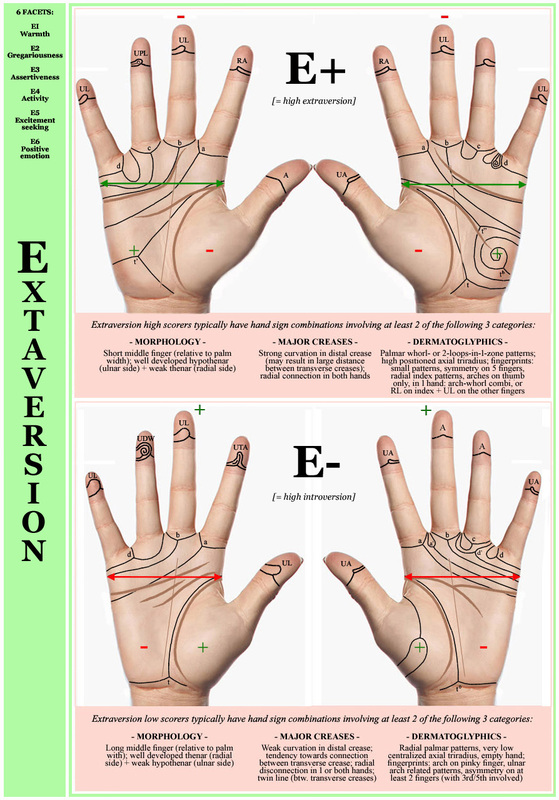 various 2D:4D digit ratio studies) point out that both the thumb and radial hand show correlations with tendencies towards introversion & internalizing behavior, while the ulnar side of the hand shows a reversed tendency towards extaversion & externalizing behavior. The fundamental explanation for these relationships can be found in anatomic structure in terms of nerves and dermatomes; the thumb & radial side of the hand is connected through higher located cervical nerves (in the spinal column) with the brain - which implicates that the ulnar side of the hand is in the spinal nerve system located more close to spinal nerve systems that regulate the heart and the other internal organs. This shows in a nutshell why your thumb is more closely connected with your brains, and why in terms of behavior your thumb is connected with your 'inner world'! 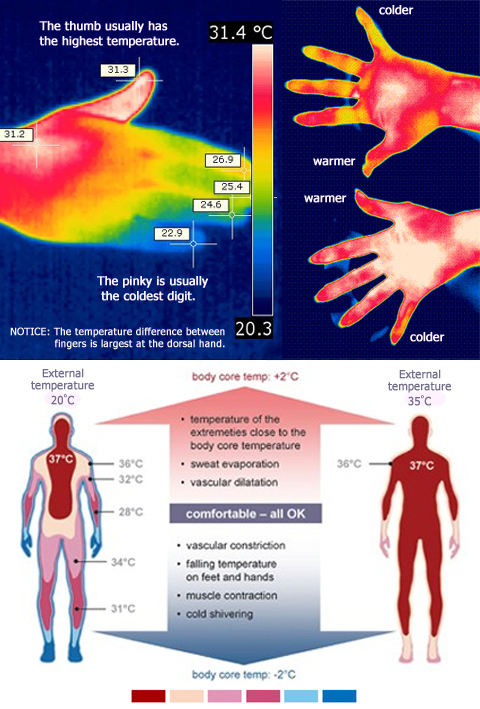 - The temperature of the thumb is higher than the pinky finger (which is in line with the fact that the core of the body has a higher temperature than the externalized body parts) - see 1st picture below. - In hand reflexology the thumb gets associated with the spine (= core part of the body), while the pinky and ulnar side of the palm get associated with the externalized body parts - see the 2nd and 3rd picture below. 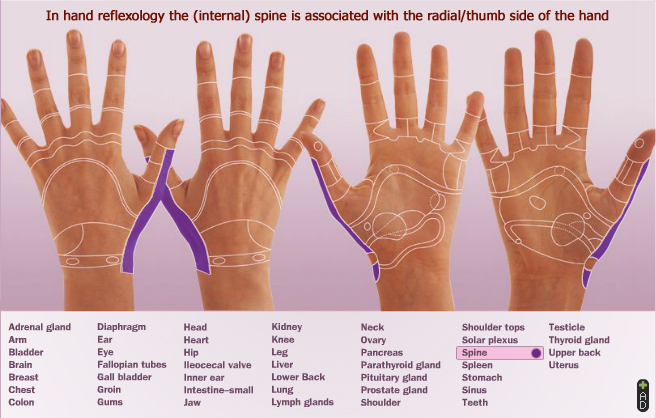 Here's another hand reflexology map describing how the radial side of the hand gets linked with the core of the body (e.g. the spine), and the ulnar side with the more externalized body parts. One can also see how the ears are located at the ulnar side of the hand, and the eyes (which are more close to the central axis of the body) are located at the radial side of the hand. For me the thumb has many levels of understanding, yet the most important is the power, capacity of awareness . to watch your thoughts , to see the flow of ideas, comes from the witness, the great conscious aspect. Wisdom also in alined with this aspect show by the thumb. knox gillespie wrote: For me the thumb has many levels of understanding, yet the most important is the power, capacity of awareness . to watch your thoughts , to see the flow of ideas, comes from the witness, the great conscious aspect. Wisdom also in alined with this aspect show by the thumb. Thanks for adding your thoughts; I can relate to what you just described. And I observe that your word-choice appears to resonate very well with what I described as 'the inner essence'. 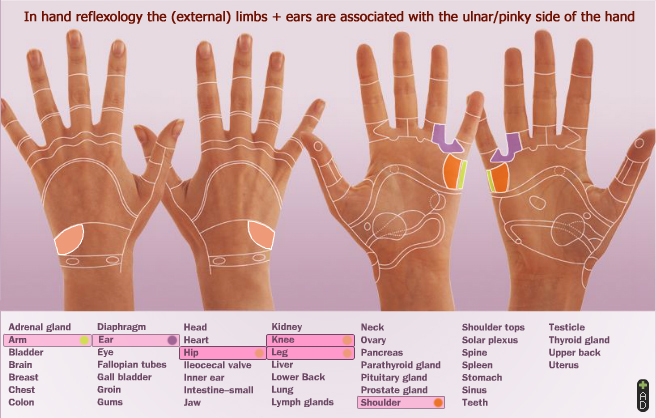 To add my view this will also help to get more information related to thumb and characteristics of person. "The prenatal anatomic development of the hand provides various clues which indicate that the development of the creases (R.S. Bali, 1994; page 50, 51 & 85) and dermatoglyphics (A.G. de Wilde, 1979; page 208) both manifests earlier at the radial side of the hand. 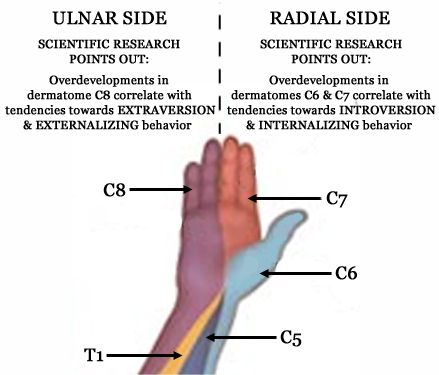 This provides a deeper understanding why the radial part of the hand tends to correlate with internalizing & introvert behaviors and the ulnar part of the hand tends to correlate with externalizing & extravert behaviors, because In it's a prental fact that the internal body parts tend to develop before the external body parts!"